Most people recognize that familiar call of the black-capped chickadee. It’s often heard in late summer and fall as chickadees gather in family groups and small feeding flocks to prepare for the winter. The chickadee’s song—translated as “Hey, sweetie,” (though you can’t often hear the third syllable)—is reserved for late winter, spring, and summer, when the bird is courting and nesting. Nothing brightens a mid-February day more than when a chickadee sings because to those who hear it, the song signals spring’s arrival. The black-capped chickadee is the September bird species highlighted by the Forest Preserves of Cook County. Come #birdthepreserves with the FPDCC; there is a free walk at the Garden on September 17, 7:30 to 9 a.m. The black-capped chickadee is considered a non-migratory species—it can survive the harsh winters of northern Illinois. These birds can lower their body temperature when sleeping at night, which protects them from freezing. While some birds need to leave the region in fall because insects and other food will soon become difficult to find, chickadees know how to find insect larvae overwintering in tree bark (although flocks of chickadees do make small geographic movements, depending on food availability in colder months). They also stash seeds to eat later, and unlike squirrels, they remember where they put them. Chickadees eat berries and animal fat in winter, and they readily come to feeders feasting on seeds and suet. Supplemental food, especially sunflower seed from feeders has been shown to help these little balls of feather and hollow bones survive when it gets really cold and wet outside. Those who feed birds can observe an interesting behavior in chickadees—they form a hierarchy, meaning the top chickadee gets to eat at the feeder first—it snatches a seed and leaves, then the second in command gets its turn. 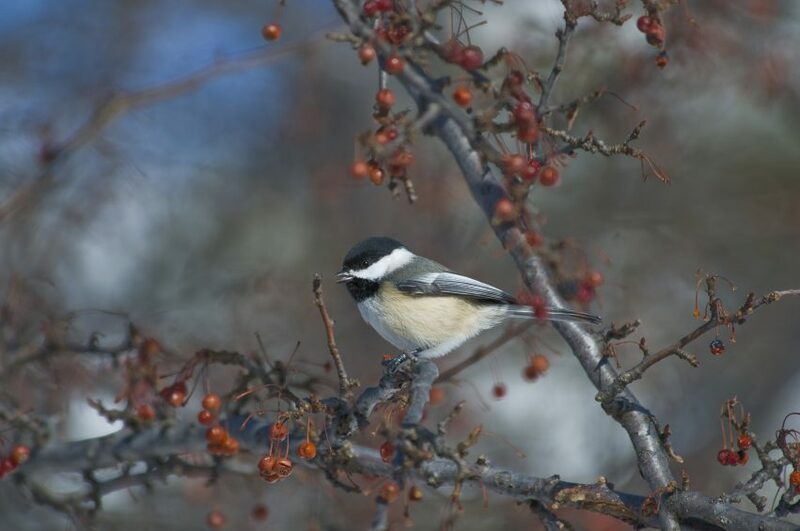 A black-capped chickadee enjoys a plentiful and tasty treat in early February: berries. In February, chickadees begin singing and looking for a cavity hole in which to nest—and there’s a wide variety of homes they’ll find suitable. They’ll choose abandoned woodpecker cavities and man-made nest boxes, or excavate their own small, natural cavities. Chickadees will nest in rotted, old wooden fence posts and abandoned mailboxes, and a pair once built a nest in an old shoe hanging from a line. The female builds a cup-shaped nest with moss for the foundation, lining it with rabbit fur or other soft material. She has one brood each year, laying an average of seven to eight eggs. After 12 days of incubation, the young hatch, then remain in the nest for another 16 days. When they fledge, they continue to follow their parents, calling and begging for food. Come winter, they travel in small feeding groups, often with nuthatches, titmice, and other small songbirds. West Nile, which came to the U.S. about 17 years ago, likely may not have affected black-capped chickadees as much as some thought, according to a recent study. 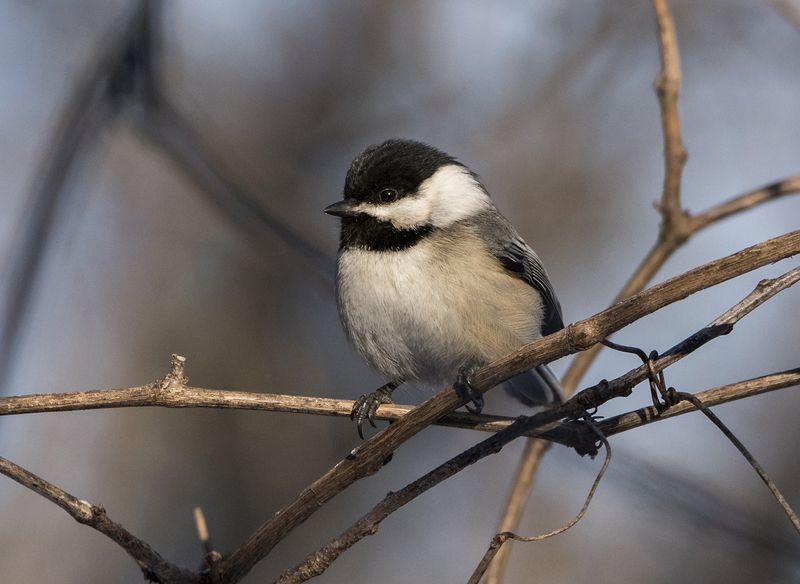 Though people were seeing fewer chickadees in their backyards and in woodlands when the virus came to the region, a 2015 study showed that overall black-capped chickadee numbers have not been affected by the mosquito-borne disease, especially compared with other species. Studies will continue on how the virus is affecting bird populations—but one thing is for certain—when the virus struck, it reminded humans not to take for granted the common birds they enjoy. And the black-capped chickadee is certainly a species that humans enjoy watching and hearing.